Egypt’s President Mohammed Mursi, who is leading mediation efforts between Hamas and Israel, says he expects Israeli forces to end air strikes on Gaza later on Tuesday. The comment came as US Secretary of State Hillary Clinton is heading to the region to support ceasefire efforts. Israel says it has put plans for a land invasion of Gaza on hold. But it has also told villagers in north, south and east of Gaza to move to central areas for their own safety. The conflict began last Wednesday when Israel killed a Hamas military leader, saying it wanted an end to rocket attacks from Gaza. More than 110 Palestinians and three Israelis have been killed. Tuesday has seen a reduced level of violence, correspondents say, even though Israel has conducted some strikes. One was a “direct hit” on two militants in northern Gaza, the Israeli military said. It also said about 90 rockets had been fired from Gaza toward Israel, and that more than 50 had been intercepted by Israel’s Iron Dome missile defence system. Five soldiers were wounded in one rocket attack, the military said, without specifying the location. Local journalists say they saw Hamas fighters summarily execute six people on Tuesday afternoon for being Israeli informers. President Mohammed Mursi said Israel’s “aggression” against Gaza would end on Tuesday and Egypt’s mediation efforts would produce “positive results” shortly, the official Mena news agency reported. He added that a ground invasion would “be the starting point for a new phase of the struggle of liberation”. Hillary Clinton is due in Israel for crisis talks later on Tuesday. She will underline that “the best way to solve this is through diplomacy”, said Barack Obama’s Deputy National Security Adviser, Ben Rhodes. 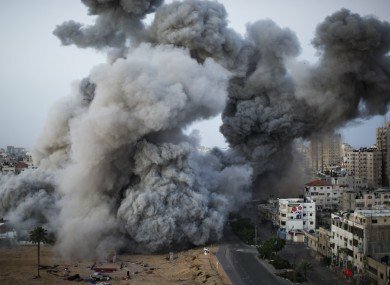 During the previous night, the Israeli military said it had carried out about 100 strikes, mainly on smuggling tunnels and underground rocket-launching facilities. Hamas officials say seven people were killed. UN Secretary General Ban Ki-moon met Arab League Chief Nabil al-Arabi in Cairo on Tuesday, before heading for talks in Israel. “I’m here to appeal personally for an end to the violence and to offer my ongoing efforts to achieve a ceasefire,” Ban Ki-moon told a joint news conference in Cairo. Ban Ki-moon warned against a ground operation in Gaza. Egypt has been trying to broker a ceasefire with the help of Qatar and Turkey. Turkish Foreign Minister Ahmet Davutoglu and Arab foreign ministers are expected to visit Gaza on Tuesday. Israel, as well as the United States and the European Union, regards Hamas as a terrorist organization.